At the end of September, I was able to travel to Ogden, Utah to attend a workshop and the Federal Duck Stamp judging as a Jr. Duck Stamp Ambassador. 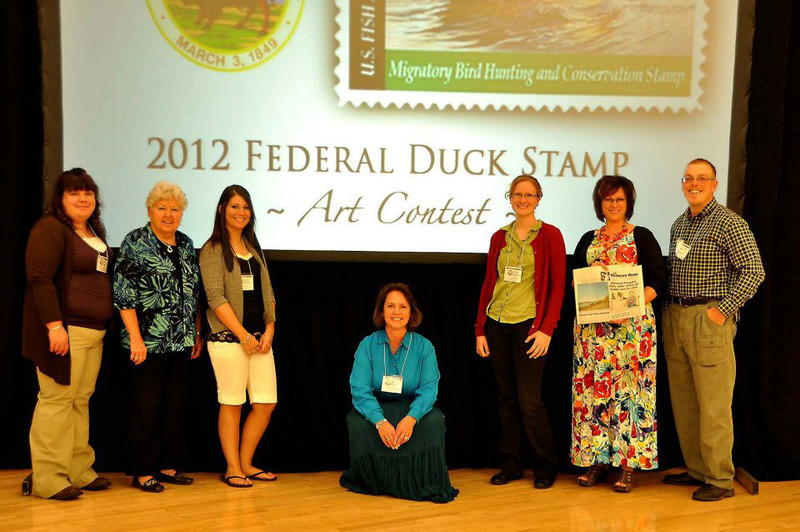 Until I became an official ambassador, I didn't realize just how many people don't know about Duck Stamps! The legal name for a Duck Stamps is Federal Migratory Bird Hunting and Conservation Stamp. The first Duck Stamp was released in 1934 and was designed by J. N. "Ding" Darling. Duck Stamps have been one of if not the most popular and successful conservation programs in US history. 98 cents of every dollar paid for Duck Stamps goes to purchase or lease wetlands for protection in the National Wildlife Refuge System. Since the program's inception, more than $750 million has been raised and used to secure over 6 million acres of wetlands habitat. Duck Stamps are not just for hunters, though they are the largest group to purchase them. 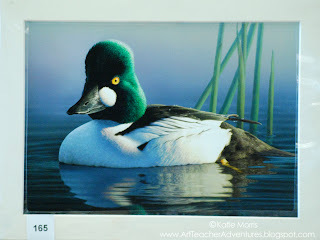 Duck Stamps are for anyone who cares about habitat conservation, birds, or awesome art on stamps. Only a few species are allowed for the contest each year. You may be wondering how I come into the picture... I learned about the Jr. 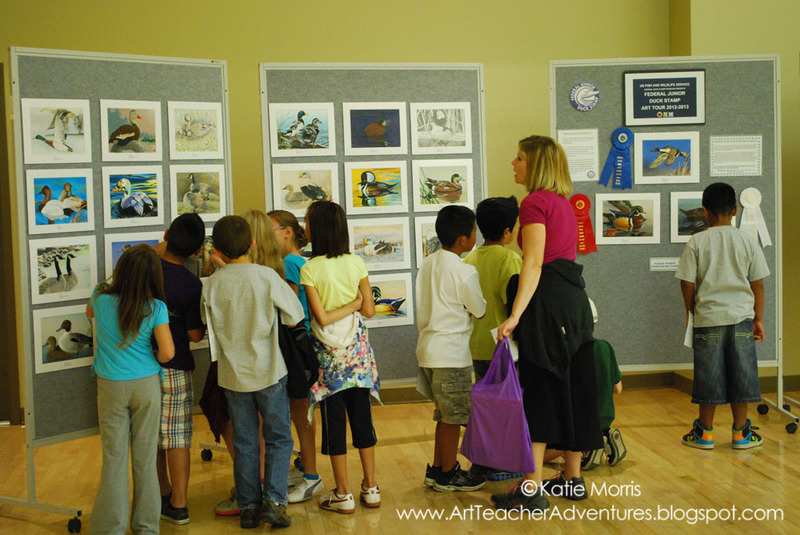 Duck Stamp program, which is modeled after Federal Duck Stamps and strives to teach youth about conservation through the Arts, as a high school student. When I took my first ever Art class as a freshman in high school, participating in the Jr. Duck Stamp program was a requirement. The next three years, I participated out of choice, because I enjoyed it so much, and developed a love for waterfowl. I grew up in a "sporting" family around lots of hunting, fishing, and trapping. I could see the value of the Jr. Duck Stamp program and know that Conservation is very important. 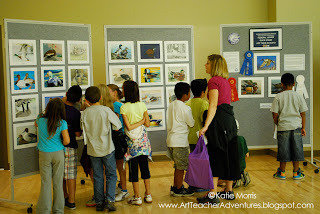 I started teaching my students about Duck Stamps from the beginning of my career and try to teach others about them as well. This led the Kansas coordinator for the Jr. Duck Stamp program to recommend me as an Ambassador. Jr. Duck Stamp Ambassadors are a new thing. 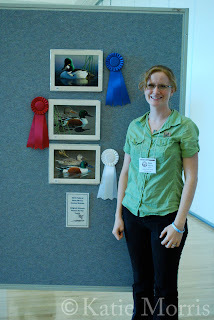 FWS Region 6 was hosting the Federal Duck Stamp contest this year and decided it was a good time to try. I feel so honored to have had this opportunity and hope I can help get other teachers (or parents, or scout leaders, etc.) involved. The first day of our workshop involved touring the Bear River Migratory Bird Refuge (which I wrote about here) and a little reception in the evening with all the FWS people, judges (though we didn't know who they were until the day of judging), and ambassadors. 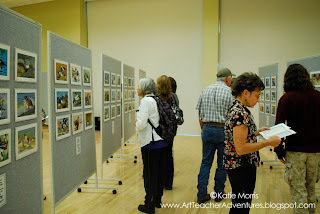 The second day was round 1 of judging, Ambassador discussion time, and a talk by two of the Birds in Focus photographers. 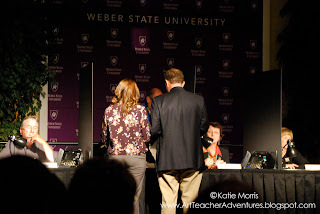 The third day was the final rounds of judging, more workshop time, and more awesome food. The judging was INTENSE! All the 192 entries were displayed in one of the ballrooms before the beginning of Round 1 and were replaced as they were eliminated. Here are some observers checking out the artwork. There were a LOT of students and teachers attending Day 1 of the judging. Here is a class looking at all of the Jr. Duck Stamp winners from across the US. Part of our job was to talk to the students and teachers attending and pass out the purple bags you'll notice the teacher above holding, filled with paper, art supplies, and information on the Jr. Duck Stamp program. Round 1 was pretty brutal. Here you can see the 5 judges (who are highly qualified and represent wildlife photographers, biologists, and stamp experts) voting "In" or "Out" on one of the entries. The judges have dividers between them so they are not influenced by anyone else. There was a small screen in front of each judge that I'm assuming had a picture of the artwork. Volunteers walked the artwork across the stage so the judges could see the original before voting. All 192 entries were voted on in this fashion during Round 1. I think the 192 was narrowed down to 60, then 7 more were brought back for a total of 7. After Round 1, each judge has the power to bring back up to 5 eliminated entries that they feel deserve more consideration. In Round 2, starting the next morning, the judges give each of the remaining entries a score of 1-5, 5 being the best. At the end of Round 2, all of the entries with the 5 highest scores move on to Round 3. Voting in Round 3 is carried out in the same score 1-5 method. At the end of Round 3, we had a first place winner, but a tie for 2nd. Round 4 was the tie breaker. The volunteers above were showing the judges the two pieces tied for 2nd place, side by side. A final 1-5 vote was taken and the winners were announced! The winner, which will be reproduced on the 2013 Federal Duck Stamp to be released next June, was a common goldeneye created by San Francisco artist, Robert Steiner. If you are interested in learning more about the Jr. Duck Stamp program, please don't hesitate to contact me or check out the Jr. Duck Stamp website. This is a K-12 program that can be taught at school, at home, or in other groups like Scouts or 4H. The new curriculum guides have been redesigned to better reflect national standards across Science and Art. I was so excited to find this your site! Me and my family went to Sanibel this summer and I took many pictures of this project while visiting Ding Darling. My question is, can I print non-copyrighted pictures of water fowl from the internet for my students to use as their inspiration to draw? I don't want to infringe on any artists rights, but cannot actually bring students out in the wild to observe. I also took a lot of pictures of the wood carved ducks at Ding Darling, are those ok for me to show as inspiration as well? Thanks! As both a photographer and an artist, the answer to your question is both yes and no! Did you know that all photographs on the internet are actually copyright to the photographer? Even if you see no Copyright info on the photo, it is more than likely copyrighted! Copying it could get the student in trouble- especially if they win the contest. That said, some photographers license their photos under a "creative commons" license, and depending on that license there are different restrictions that are on the photo. To search for some of these images, I suggest trying flickr.com, and go to "advanced" search. You can then search ONLY creative commons photos. 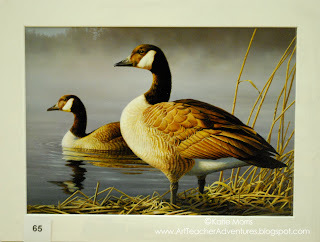 Even still, directly translating a published photograph into a piece of art verbatim is against the duck stamp rules. Encourage your students to use multiple sources of inspiration and more than one photo to compose their artwork. See if you can loan out mounted ducks from a local museum or your local fish and game office (you'd be surprised how nice they can be!). Mounted ducks will help fill in for the visual information that students might lack in photographs. Did you see the funny little deer at Ding Darling? We just learned about them and I know they were somewhere in Florida, just can't remember which reserve.